Each one of us walks our own path through life. We are individuals with unique beliefs, views, experiences, and desires. We receive plenty of recommendations from friends, family, coworkers, and others with good intentions to help improve our lives. Applying these recommendations may indeed result in some level of success. However, during our Financial Independence journey we will face life-altering decisions – critical decisions that will require more than an anecdote or an example from an online article to make with confidence. What if there was a more fundamental way of making decisions, a method that moves us closer to who we really are and allows us to live a more authentic life? Let’s consider values-based decision-making. Thought precedes action—we reflect on the values that we believe will allow us to get our needs met and make decisions accordingly. The decisions that are made are not based on past experiences. They are based on the future we want to create. We are in control of our action and behaviors. We can consult with others to support and enhance our decision-making. We make values-based decisions so that we consciously create the future we want to experience. For example, if we value trust, then we should make decisions that allow us to display trust. If we value accountability, then we make decisions that allow us to display accountability. 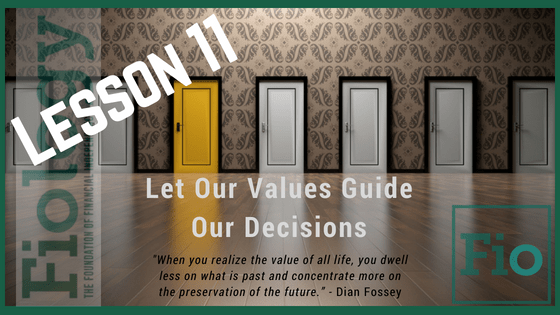 The purpose of this lesson is to identify our values and begin making decisions based on these values. Take Action: Using the Mind Tools process above, determine your top values. Record them somewhere you will see often. A folded 3×5 index card kept in your purse or wallet may work well. As you are faced with decisions, major decisions in particular, keep these in mind. Continue to validate or reaffirm your values over time. Sharing these values with your significant other can also help them understand why you make the decisions you do. Encourage them to determine their values using the same process and share with you. In the comment section below, feel free to share your top 3-5 values.